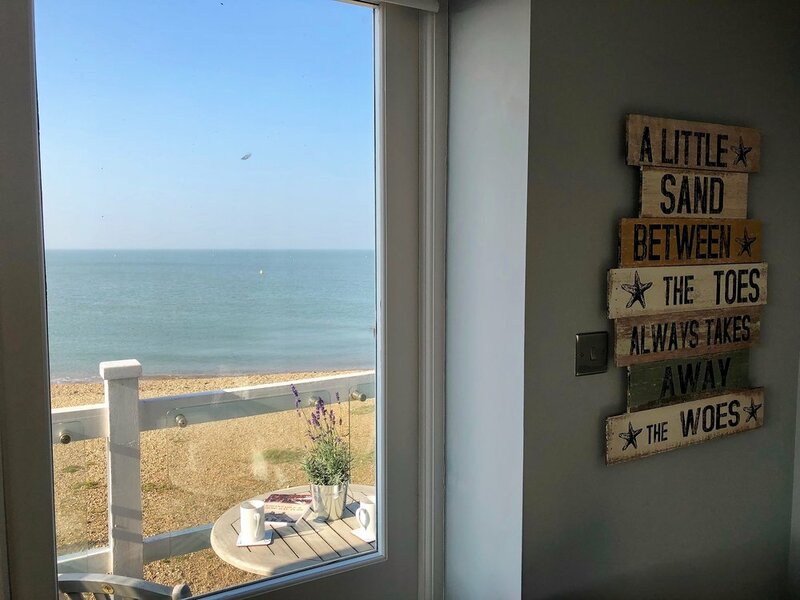 Blue Point is the perfect seaside haven for families and friends who want to be by the sea and enjoy the delights of Whitstable’s stunning sunsets. 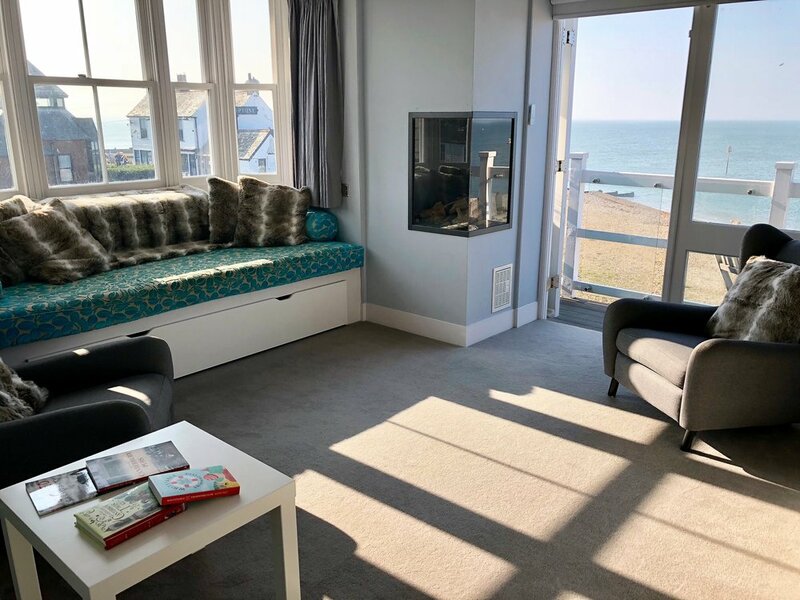 Situated right on Whitstable Beach, it enjoys extensive sea views from the seaside inspired living areas and master bedroom, as well as two balconies where you can relax and soak up the sun. The property is just a short walk along the beach promenade to the harbour with its fish and village markets and a 5 minute walk to pretty Harbour Street with its unique independent shops and eateries. Access to the ground floor is via some steps from the rear courtyard garden. There is a spacious shower room with walk in shower, basin and wc. 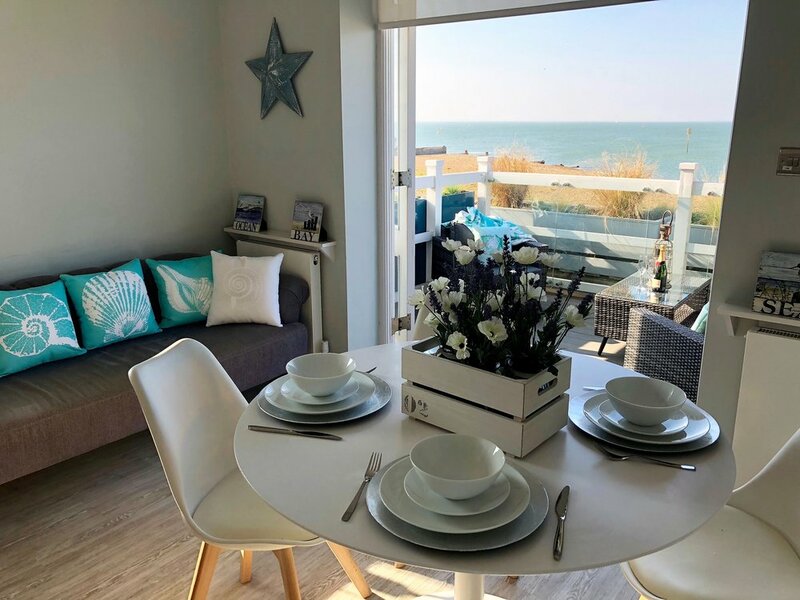 The light and seaside inspired kitchen is equipped with fridge and freezer, dishwasher, electric oven and induction hob, microwave and lots of cupboard space. There is a round table and four dining chairs, as well as a chill out 3 seater sofa. You can access the ground floor balcony via French doors which open fully so you can enjoy the views from the dining table or relax on the wicker sofa and armchairs with coffee table outside. There is a utility cupboard at the foot of the stairs with a washer/dryer and iron and ironing board. 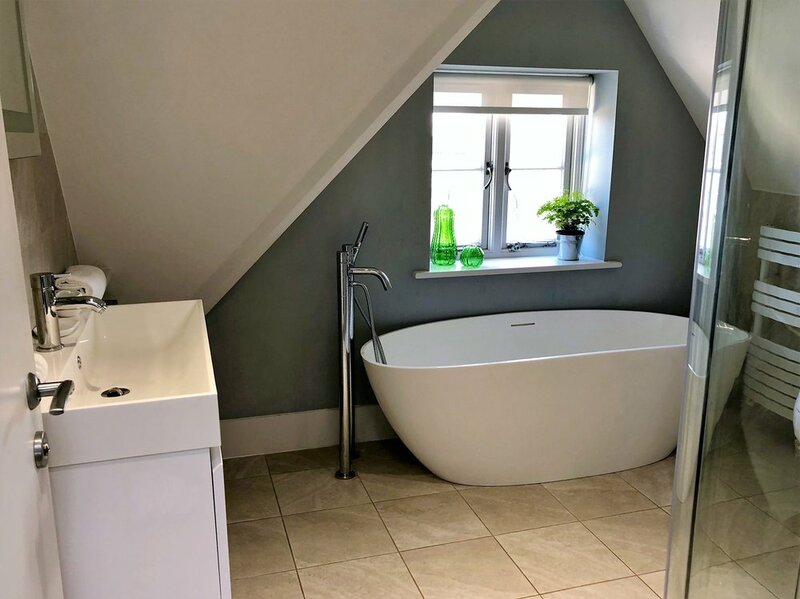 There is a charming twin bedroom at the rear of the property that has two raised single beds, pretty seaside accessories and a fitted wardrobe with hanging and drawer space. The lounge is filled with light and enjoys dual aspect sea views. You can chill on the raised window seat sofa or relax in the two armchairs and watch the waves. The window seat has a single pull out trundle floor bed which can be used for a 5th person. There is a large flat screen TV with DVD player, as well as a gas effect fire for colder months. French doors lead you onto a smaller balcony with bistro table and chairs, perfect for enjoying the sunsets with a glass of local wine or beer. There is a good sized family bathroom with free standing bath, walk in shower, basin and wc. 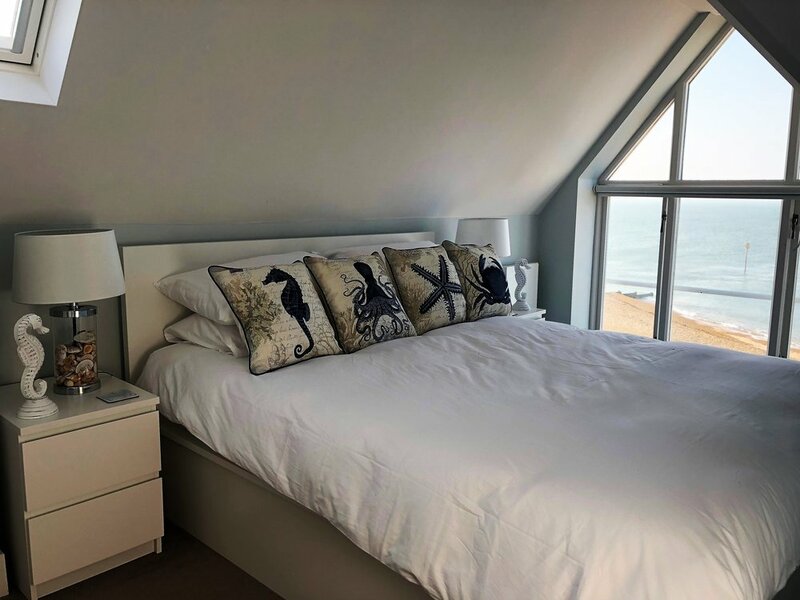 The master bedroom has been decorated with seaside inspired cushions and décor and has a king size bed, bedside cabinets with drawers and lamps, and a large fitted wardrobe with hanging and drawer space. There is a sweet courtyard garden at the rear of the property and two balconies at the front of the house to relax in. There is one private parking space for the house. It can be a little tight when all the properties in the private development are occupied, so we suggest it is more ideal for medium size cars and not wide vehicles or large 4WD. We loved our stay at Blue Point last weekend. It’s in an amazing location right on the beach with stunning views over the sea. Lovely waking up to views of the sea - the electric blinds were a nice touch! The terrace off the kitchen/diner is a great place to people watch and the sitting room and balcony on the first floor were the perfect place to watch the stunning sunsets. A bonus to have a parking space too. Gail and Chris were very welcoming and very easy and efficient to deal with before and after our stay. The early check in and late check out was appreciated too. We hope to be back very soon! We had a lovely stay at Blue Point, which is a fantastically located property right on the beach and immaculate inside. Whitstable Holiday Homes were brilliant right from the initial booking, throughout our stay and after the checkout. I would definitely use them again, it was very professional and personal service. RENTAL PERIODS: Weekly rentals from Friday - Friday during school holidays. Weekend and mid-week breaks available in low and shoulder seasons. PLEASE REFER TO THE BOOKING CONDITIONS FOR FULL DETAILS.